Looking to slim down for summer? Struggling to lose those last few pounds? You know getting cardiovascular exercise is critical to losing weight and getting in shape. But there’s an essential component of weight management that many Americans overlook: strength training. It may feel like weight training doesn’t burn as many calories as cardio, and so doesn’t provide us with the most bang for our workout buck. However, strength training can rev up your metabolism, and help you burn more calories throughout the day than you would with cardio alone. Simply put, your body has to burn calories to in order to maintain muscles. According to WebMD, ten pounds of muscle in the body burns more than twice as many calories as ten pounds of fat. 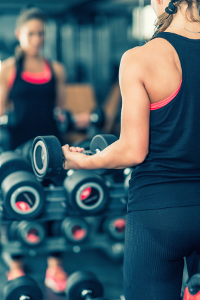 Adding strength training to your routine can help you meet your weight goal faster than just doing cardio alone. Doing the same cardio activity over and over means we only use the same muscles over and over. The same goes for any activity we perform repeatedly or for long periods of time (like sitting or standing in the same position all day at work). This can foster imbalances in muscle strength, causing stress on our joints and ligaments. This stress leads nagging pains or injury, which can keep us from being active. Need a little guidance? A trainer or physical therapist can help you focus on form and functional strength. Using strength exercises to target the muscles you don’t use heavily during your cardio workouts or your workday can help keep your body from being heavily imbalanced in any one area. That balanced strength can keep the joints from being stressed, thereby reducing pain and chances of injury. And if we’re not bogged down by pain, we’re much more likely to stick to an active routine. If you’re not sure where to start or what muscles to target in your strength workouts, try scheduling a session with a physical therapist or personal trainer. Scared that strength training will make you too muscular? If you’re female, think again. The International Sports Science Association notes that most women’s bodies simply can’t produce the testosterone required to sculpt bulging, bodybuilder-style muscles. It’s clear that if you’re interested in reaping the full benefits of exercise, adding a few strength-building workouts into your routine is a must. Shoot for 2-3 weekly strength training sessions to complement your regular cardio activity. Always warm up before you start. Make sure your form is on point! Form is critical. If you can schedule a session or two with a trainer or physical therapist to get pointers on your strength training form, do it! Regardless, research proper form for the exercises you want to do and use a mirror to make sure you’re moving correctly. Strengthening your body isn’t just about pumping iron. There are plenty of body weight exercises you can do at home to build muscle. Pace yourself. Start by using your body weight or light weights, and work up to adding heavier weights or resistance bands. Try compound exercises to get the most tone for your time. These exercises recruit several major muscle groups at once, and can help improve coordination and balance, to boot! PopSugar provides a list of basic compound exercises, and a quick Google search will give you plenty of advanced options. Always cool down and stretch out to finish your workout.